This fantasy adventure fairy tale is based on an adorable sweet girl named Yuuki Wakasa. She's just your typical 5th grader and big sister who's responsible for her three little brothers. One day while walking home she catches a red magic stone that mysteriously falls from the sky. Yuuki soon discovers the stone's magical powers when she looks in the mirror and sees a reflection of a beautiful dark-haired girl who reveals to Yuuki the secret powers of the stone: it allows her to travel from the human world to a dream world known as Takamagahara. 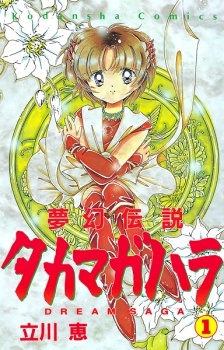 Mugen Densetsu Takamagahara was published in English as Dream Saga by Tokyopop from August 1, 2004 to August 1, 2005.